Back in the summer we took the Stromberg Pontiac to Neil Tadman at Neil’s Auto Interiors, down in Essex, (here in the UK) for a little interior trim work. When we bought our ’55 Pontiac, the trim condition was one of the main things that made us click “BUY IT NOW”. But it was pretty filthy and the driver’s seat area was a little ripped too. Still, we set to with various interior cleaning products and a bucket of soapy water and pretty soon we knew what we had. The back seat came up like NEW, which amazed us. The door panels too, cleaned up great, and the rear trunk area responded well to a lot of scrubbing and silicone based detailing spray. The front seat, though, was onto a loser from the get go. Not just the previous too-bright red repair and the sun shrinkage, but also my jeans caught in the rip and made it about ten times worse. Fact is, the vinyl was so hard and nasty, it was well beyond saving, so Neil found some new materials which matched the sun-faded rear and trimmed the whole front seat. It may not look it in the pictures, but the match is incredible. To say we were pleased is an understatement. It’s given the car a whole new lease of coolness. 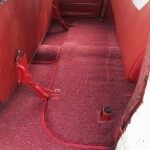 On the floor, the car came with a red plastic mat, which after so many years was way crispy. Every time anyone got in the car, it cracked some more and fell apart. And once we had to get it all out to put new metal floors in, of course, it all had to go. 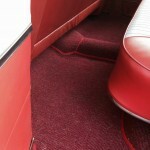 Neil replaced the lot with some nice red square weave carpet, backed with sound deadening and edged with cotton binding that he dyed up to match. He added a couple of practical heel pads in the front and we were home free. As you can see, it goes all the way under the rear seat. So, one more tick off the list for the Stromberg Pontiac. Click on the pics for bigger views. It’s about time we fitted those 97s. Stay tuned! 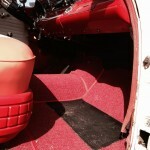 This entry was posted in Our projects and tagged Pontiac, project, Stromberg by Clive. Bookmark the permalink.